The revolutionizing technology of optical coherence tomography (OCT) is celebrated in a special section of the Journal of Biomedical Optics, published by SPIE, the international society for optics and photonics. Detailed to the microscopic scale and noninvasive, OCT yields 3D images of tissues inside the body and is a dominant diagnostic tool in ophthalmology with potential in numerous other areas. OCT image volume and associated coordinate system. Optical coherence tomography (OCT) has revolutionized ophthalmology in the 25 years since the technology’s inception, by providing the capability to noninvasively measure and create 3D images at the microscopic scale of tissues inside the body. Now increasingly used in cardiology, dermatology, and other medical specialties, new opportunities continue to emerge across a wide range of fields beyond medicine and biology. Now the dominant diagnostic tool for conditions such as macular degeneration and glaucoma, OCT technology continues to offer potential in areas from fundamental research to clinical applications. A special section on OCT published by SPIE, the international society for optics and photonics, in the December issue of the Journal of Biomedical Optics (JBO) (http://www.spiedigitallibrary.org/journals/journal-of-biomedical-optics/volume-22/issue-12#SpecialSectionon25YearsofOCT) provides an expert perspective on applications in medicine and biology, particularly those outside ophthalmology. Guest editors are David Sampson (University of Western Australia), Peter Andersen (Technical University of Denmark), Ton van Leeuwen (Academisch Medisch Centrum), and Ruikang (Ricky) Wang (University of Washington). The special section illustrates how, as the technology has matured and some applications have reduced in cost, fresh opportunities pave the way for a new generation of OCT technology translators. OCT remains true to the spirit of the broader field of biophotonics itself, the guest editors noted, with the focus on practical engineering to tackle practical challenges. OCT as a research topic is vibrant and robust, with many new opportunities in the wings waiting for clinical and commercial prime time. The emerging application areas of gastroenterology, dermatology, and oncology, as well as more speculative earlier stage clinical applications in gynecology. Visible-light OCT and ocular biomechanics probed with OCT, in ophthalmology. 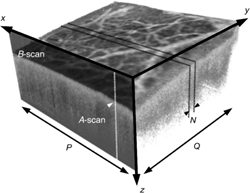 In “Spectroscopic Doppler analysis for visible-light optical coherence tomography,” Xiao Shu (Northwestern University) et al. discuss a method for quantifying oxygen saturation and retinal blood flow velocity in vivo. The capability to hold the imaging instrument in hand — an enabling technology for a raft of applications. Guillermo Monroy (University of Illinois at Urbana-Champaign) discusses handheld OCT systems that pave the way for widespread adoption of OCT into point-of-care or point-of-procedure applications in both clinical and commercial settings. Polarization-sensitive OCT, with applications in treating osteoarthritis, burn scars, and oral tissues. “Quantitative light-induced fluorescence technology for quantitative evaluation of tooth wear,” by Sang-Kyeom Kim (Yonsei University College of Dentistry) et al. describe a noninvasive tool to monitor the progression of tooth wear and estimate enamel thickness. The special section also includes a historical account of the life and work of a pioneer of OCT, Adolf Fercher, who died in March 2017, written by his close colleague Christoph Hitzenberger (Medical University of Vienna). Brian Pogue, Professor of Engineering at Thayer School of Engineering at Dartmouth, is the editor-in-chief of the Journal of Biomedical Optics. The journal is published in print and digitally by SPIE in the SPIE Digital Library, which contains more than 460,000 articles from SPIE journals, proceedings, and books, with approximately 18,000 new research papers added each year. The journal will become fully open access on 1 January 2019.